This is the highest performance IP Camera series available from Hanwha Techwin (Samsung). These surveillance cameras are excellent for creating an IP camera system that can provide immediate notifications of security threats. The X-Series uses the latest Wisenet 5 chip. You get the very best low light sensitivity, highest performance wide dynamic range (up to 150 dB WDR), as well as some very helpful advanced analytics. If you need to be notified when your laptop goes missing, or create an alarm when someone screams in the lobby, this is the camera series for you. The camera family supports the latest H.265 compression and adds WiseStreamII Compression technology to provide some of the lowest bandwidth and storage requirements available. The family includes box, dome, bullet, and an amazing new PTZ camera that can see over 1100 ft. in total darkness. Remote control of the zoom lens, focus, and position of the camera. Can remotely pan, tilt and rotate the camera for set up. Remote control of zoom lens, focus. Minimize Lens Distortion: Lens distortion typically causes straight lines near the edge to curve outwards from the center of the image. 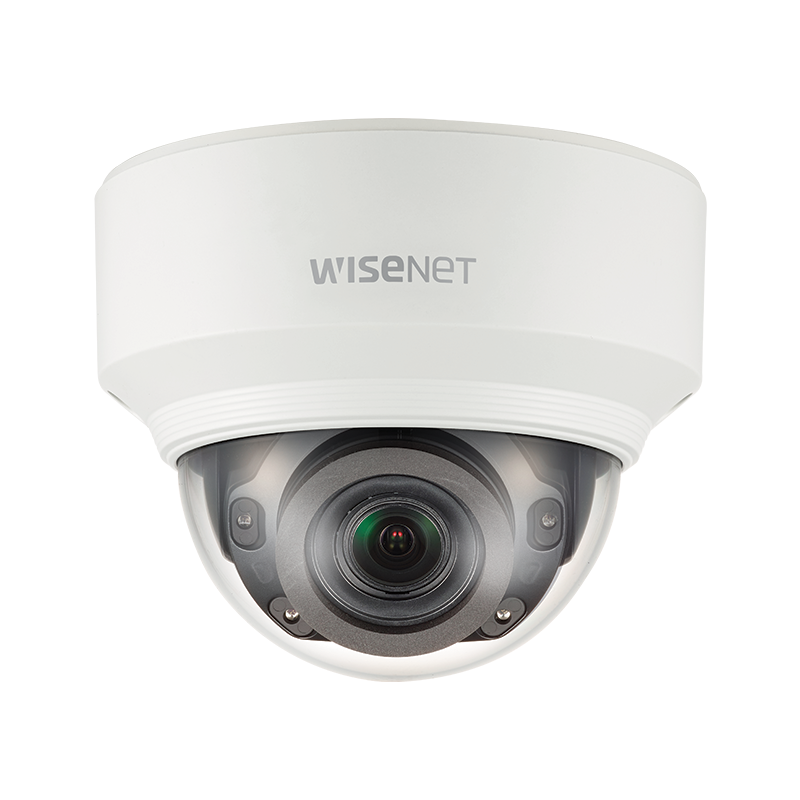 With Lens Distortion Correction technology integrated into the Wisenet X series, image imperfections can be easily corrected. These IP cameras provide excellent specifications, especially their low light sensitivity of 0.001 lux in B/W mode. The camera includes a USB port for easy setup, as well as two-way audio and advanced analytics. This high-resolution 2-Megapixel PTZ camera has excellent performance. It includes a 37X zoom lens (6 ~ 222mm), with an additional 16x digital zoom. The long zoom lens allows you to identify a license plate number over 1,000 ft. away day or night. This IP PTZ camera includes analytic functions such as Auto tracking, and Intelligent video analytics. This is a relatively long range camera with an IR illuminator that allows you to see over 1148 ft (350 m) in total darkness. For more information about other night-vision PTZ cameras, take a look at PTZ IR IP Camera page. For more about very long-range, night-vision cameras take a look at our Long Range Night Vision PTZ Cameras page. This high-resolution 2-Megapixel PTZ camera has excellent performance. It includes a 32X zoom lens (4.44 ~ 142.6mm), with an additional 16x digital zoom. The long zoom lens allows you to identify a license plate number over 900 ft. away day or night. XNP-6320HS: Stainless steel version provides outdoor protection from salt spray environments. The IP surveillance camera is only one part of the IP camera system. The surveillance system also includes the video recording system. This can be video management software (VMS) that runs on your Windows PC or a network video recording (NVR) that provides a complete recording solution that attaches to your network. If you need help selecting the right Hanwha Techwin (Samsung) camera for your IP camera system, just contact us. We have a lot of experience with IP camera systems. We can help you select the right camera and video recording system. We can be reached at 800-431-1658 in the USA, or 914-944-3425 everywhere else, or just use our contact form.